I made good progress on the Finishing correspondence course, or as it is officially titled, "Professional Finishing Course". I've finished up the reference section for Lesson 1 and I've made it available for the Masters Committee members to give it the once over since I suspect that the majority of students will be those working on Level 2. I am enjoying the process. It will be ready by the 18th. I only had a few lessons to review which worked out well since I had less time to work than I typically do. I've noticed that I've had more students from outside the US than I have in the past. Since the postal service can be so slow, I email my letter. I think it would be a good idea for all my students, US and non-US, to photograph their swatches, front and back before sending them off. You never know. I've only had one lesson lost out of thousands sent but it would be good to have the photographs in case they are lost. I've got finishing on my mind. Expect many more tips about finishing. This week's tip is about how to seam reverse stockinette stitch. This is something that is tested in Level 2 of the Masters Program. Many knitters I have met aren't aware that you use different techniques to seam different types of stitch patterns. This applies only to vertical or selvedge seams. 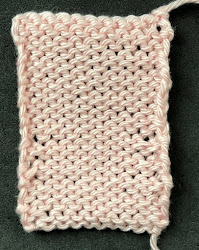 For horizontal (or bound off edges) you seam in the center of a stitch and it doesn't matter what kind of stitch it is. The mattress stitch is the best way to seam stockinette but if you use it to seam reverse stockinette stitch, the stitch pattern is not maintained on either side of the seam. This is due to the stitch anatomy. Reverse stockinette (and garter stitch) interlock on the RS while stockinette stitches are "stand alone" on the RS. I've discussed in prior blog entries how reverse stockinette stitches interlock. The stitch itself looks like a frown. The space between the stitches looks like a smile. When you seam reverse stockinette you seam the smiles on one side to the frowns on the other. As the photo illustrates these "smiles" and "frowns" can be hard to see. You have a choice. 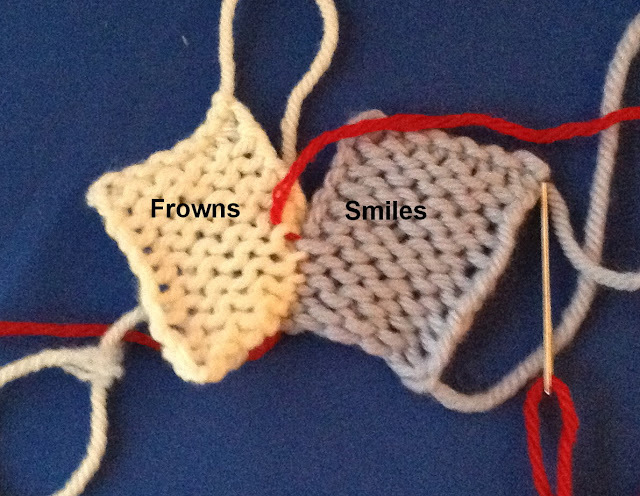 In the example in the photo, the "frowns" are actually in the selvedge stitch and really hard to see. 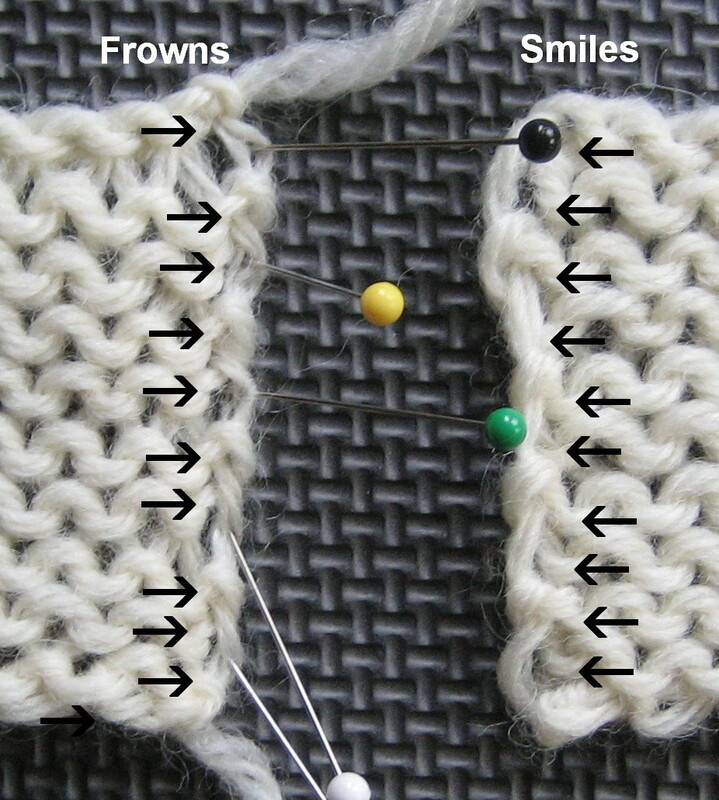 The smiles are in the space between the selvedge stitch and the first column of stitches. 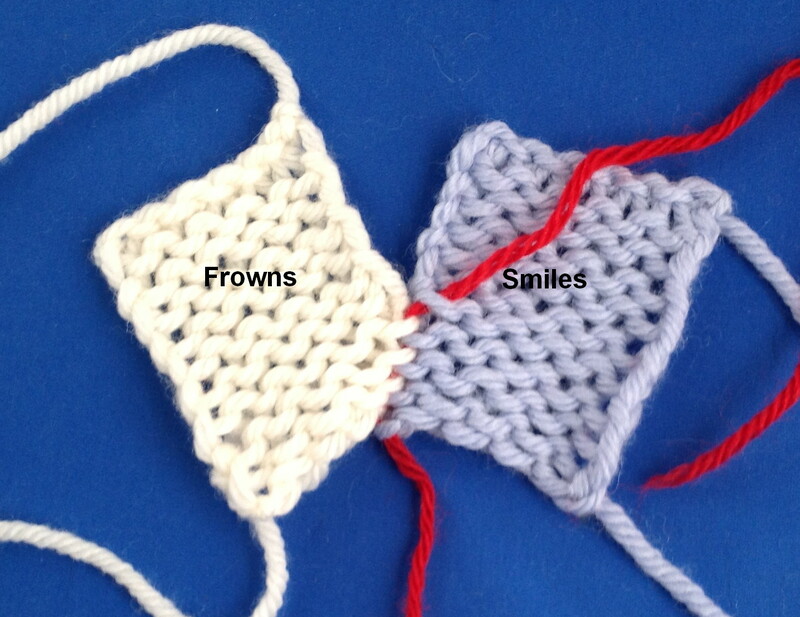 The other way you can do this is to use the "frowns" in the first column of stitches rather than the selvedge. They are easier to see. Salon will be on Sunday from 1:30-3:30. The weather should be better! Last week we had a snow storm and VERY little effort is made to clean the streets. For someone who grew up out west I find it humorous how 1/8" of snow throws everyone into a panic. I avoid grocery stores until after it snows. Krogers reminds me of photographs you've seen of the evacuation of Saigon. I wonder why anyone needs 5 gallons of milk, 6 loaves of bread and a 10 pack of toilet paper. I won't post photographs of the birthday socks until next week. I've got half of a sock left. 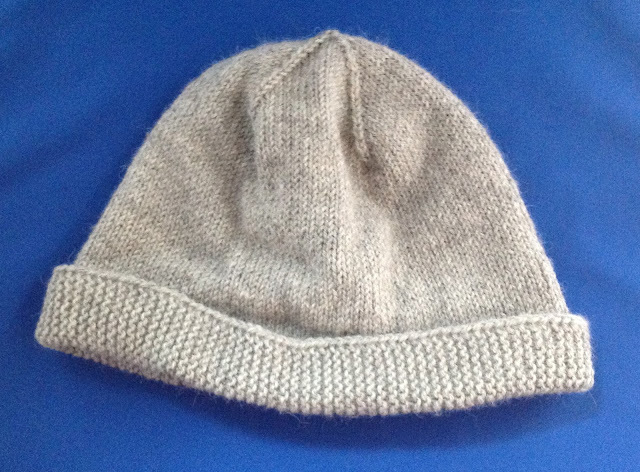 I finished the hat and my husband who never wants anything I have knitted expressed an interest in it so I gave it to him. I'm making one for me now with some Road to China (alpaca, cashmere, camel, and silk blend) I've had around forever. The photo doesn't do the color justice. I didn't get to swatch for the Utah sweater as I am still tinkering with the graphs. I did wind the skeins into balls. I hope by tomorrow I can start swatching. The "theme" of the sweater is Summer in the Uintah mountains of Utah. The top portion of the sweater will be stars in the night. The next band will be pine trees in the twilight. The bottom band will be rainbow trout in a mountain stream. In all of the season sweaters I've put in a motif as nod to the next season. This will have an aspen leaf floating in the water. The fish is a tribute to my husband's hobby. He would like the fish to look more like real trout but I've explained, this is fair isle technique, not intarsia. The sweater will have the same band as the other sweaters so I have to think about the colors for that as well. I thought it might be interesting to see the process I use for a stranded sweater so I have included the most recent charts (they will change) and the yarn. The charts for the trees and fish don't show the background colors yet. I have to play with the colors to see what I like. Hopefully I will be posting photos of the swatches next week. Here are the stars. The background will be navy and the stars will be one of the lighter blues. Elf at Redfish suggested the purple. I will swatch them all before making a decision. Here are the trees. The color for the trees is a very subtly variegated green. I think I will use one of the medium blues for the background but I will swatch several choices. I am very proud of these fish. I looked at hundreds of photographs of fish. I think they look pretty good for a charted design. The chart shows the center back and front. The fish face each other. There is a small aspen leaf in the middle. I'm still tinkering with this. I don't catch floats when I do stranded work. I design the motifs so that I don't have to. The single stitches between the fish are bubbles. The colors in the chart don't match yarn. It takes way too much time to get the colors right in the charts. The photograph shows the actual colors pretty well. The fish will be the olive-y color with coral stripes. The white or the yellow will be used in the graphic band I've used in the other sweaters. I'm not sure I will use all of the blues. We will see how the swatching goes.